BBC Radio 2’s Drivetime presenter Simon Mayo has been reunited with his old co-host Matt Williams. The pair has recorded a new podcast – called Books of the Year – which hit number 2 in the Podcast Chart over the weekend. The guests on the first full show are Robbie Williams and Lynda La Plante. 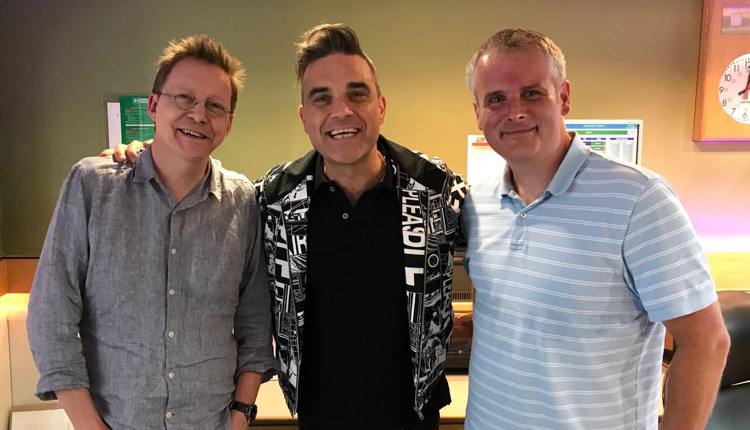 Simon and Matt said goodbye to each other on BBC Radio 2’s Drivetime show last month after eight years. Simon is now hosting the show with Jo Whiley from 5pm till 8pm each weekday. So, a bit of news. This will be last week on Drivetime. It has been a joy working with @simonmayo for the last 8 years. I’m immensely proud of what we’ve done on the show from the book club to the Mosh and Confessions. New show has good presenters but not together, this makes listening hard work. No one has a show that runs in the afternoon and overlaps the evening it doesn’t work. Now stop all this nonsense and bring back the teatime slot. Also get rid of all the repeats first thing in the morning and put on a proper show. You are losing listeners hand over fist, it wasn’t broke so why did someone think it needed fixing. Good presenters, but format doesn’t work. Just can’t listen. The changes to the Simon Mayo show have been a serious mistake. It was a good radio programme. I have listened to and thoroughly enjoyed Drivetime in the old format . Why try to amalgamate two brilliant but different presenters in a show which does not work ! Okay , you have tried it and now bring back the original and put us all out of our misery . The other side to this is plenty of people are missing the Jo Wiley show too . I have tried but the programme is awful now. I stopped listening for a week and then tried again. I won’t listen anymore until they put the programme back as it was. I hope the arrogant person who altered everything is listening to the people who pay his salary. Totally agree, please revert to the Simon Mayo show! It does not work in the new format, just awful. Simon was brilliant on his own, why spoil what was a great show? It’s true the new show is no fun and like many others I don’t listen any more. The trouble is that there is no honourable way fort the BBC to backtrack not that the displayed any honourishing or loyalty to the drive time team. Sorry two great presenters but zero chemistry together. Sad to say I no longer tune in . They should make everyone happy, admit it was a mistake and reunite the Drivetime team. What next Steve Wright in the evening? Jeremy does Jazz? Dear BBC Radio , please quit fiddling about with our tried and tested favourites. I now listen to another station as Drivetime is nowhere near what it was and doesn’t hold my interest during my long commute. Why oh why did they need to change the format when it’s so successful not necessary!! There aren’t many good women presenters on radio 2 and Jo Wiley mud be one of the worst. Totally agree with other comments. I used to listen every evening to Simon Mayo’s Drive Time, come rain or shine. Brilliant show. But, sadly, and although Jo is a really good DJ, I don’t like the new format. It simply doesn’t gel and doesn’t flow. I find it hard to listen….so I don’t. I now switch stations. Bring back Drive Time with Simon and marvelous Matt and please (Radio 2) do not fix what is definitely not broken! The old format was much better. Why won’t the BBC listen to what listeners like/want? Drivetime was great. I love Jo but its not working for them. Bring back drivetime, give Jo Steve Wright’s show because he’s an idiot but whatever you do – DON’T BRING BACK MATT!!!!! Agree with these comments. New show is dreadful. Old show was great. Why change something that worked ? Presumably a decision made by an overpaid BBC executive, paid for out of our licence fee. Anyway, please revert to the old show as soon as possible. I agree with all of the above. I can no longer listen. It’s just awful. If you need more women in daytime, move Jeremy to Jo’s old slot and put her in the 12-2 slot. I keep trying to persevere but after a couple of links I have to give up. It’s so grating. Even Confessions is ruined. Why does the beeb insist on this self-sabotage? We all know that change can be trying for all and I have to admit that I hated the new format for drivetime, but they have settled in a bit. They no longer sound like they also hate the new format…no disrespect to either as i used to listen to both shows. …they now sound (like me) resigned to their fate…no spark…forced humour…even the confession slot feels wrong…Matt’s laugh used to set everyone off … now it all feels like Dads telling a bad joke…hardly award winning entertainment…used to never miss this ..now hardly listen. I’ve never listened but can imagine how bad it could be(trailers were a stark warning)Jo’s probably a really nice lady but let’s be frank;a god awful DJ, unless bashing her ‘I invented new music’ drum. Change for change (and political correctness) sake never works. Drivetime was popular and I listened daily. The new show is disjointed and makes awkward listening. It is not a weakness to admit a mistake has been made and switch back…please!! I too no longer listen. It was perfect before but as soon as i heard Jo was joining Simon i got a horrible feeling of foreboding and i was right. Its rubbish now and its not just because im not a fan of hers. She seems to have taken over and poor Simon’s in the background. But like someone above says theres no way they will admit it was the wrong move. Please put it back as was I know lots of other people who have swiched off/over. This is a story about a podcast but the comments seems to have turned it into ‘Points of View’. I have to agree though that the changes the BBC made to the station were a big mistake. As others have said already, it ain’t broke, don’t fix it. However, the BBC should do radical things, such as making changes to Radio 1 which does need fixing, BIG TIME. I don’t listen anymore now the programme has been spoilt. Chris Evans is awful too, same awful jingles day in day out. Radio 2 must be losing thousands of listeners. I have stopped listening to drive time. Such a shame as both Simon and Jo are great presenters but have no chemistry together. Like other both great presenters but together now i turn off . Telling the listener what you want ! What was broke? What needed fixing? Bad move by BBC idiots. Bring back the old drivetime format complete with Matt. What a shame BBC had lost untold listeners with such a poorly thought out move! The Drivetime Show was ruined the day Johnnie Walker left…end of. The old show was brilliant, can’t stand Jo Wiley, never liked her presenting Glasto either! She is right up her own backside, not just me but others I know can’t stand her either! Absolute Radio, has 4 excellent female DJs, a pleasure to listen too, a bit laddette, but 100 times better than JW! The old format was nice and relaxed where you felt part of a conversation between two blokes just chatting on the drive home. I don’t like the new format, it’s almost like Jo knows she’s only got the gig because the BBC has a quota to fulfill. Whereas the Alan and Mel show works really well and is genuinely funny. If women want the same money as the men, then they need to be as good! I have stopped listening to the slot. The first I knew about the change was when I turned on radio and listened to the new format. It was so flat. Both great presenters but it didn’t sound good. Tried again and still thought the same. They both should have own show. I hope BBC reviews after 6 months and takes into account listeners comments. Why why new show a disaster no chemistry between presenters spoilt everyone’s early evening politically correct nightmare! Great idea to re-unite Simon and Matt in a podcast. However would much rather hear them back on Drive Time. Matt’s laugh made the Confession slot. It’s all very flat now. Love the new Sara Cox show and used to enjoy Jo Whiney. Just not at 5pm. Used to love the old Simon Mayo drive time show always a pleasure to listen to. Absolutely hate it now it seems like Jo and Simon are on some awkward blind date, they just don’t go together and that is not a personal criticism of them because they are fab presenters in there own right and they should have there own shows like before, some of the changes at Radio 2 leave a lot to be desired, Sounds of the sixties for instance why move it to 6am when only the very early risers can hear it? Agree with other comments when it ain’t broke why fix it? New show is rubbish and getting rid of Matt was a very big mistake. You’ve lost a listener who has listened since Drivetime started. The new show is unfortunately pants. I’ve tried listening but without Matt’s infectious laughing fits, not even the confessions spot satisfies anymore anymore I’m afraid. Poor show auntie! I agree with most of the comments and observations made in the previous statements, the drive time show was a joyous listen on a long slog of a journey home. The chemistry between Jo & Simon really doesn’t work, she is a really talented DJ but in neich field broad casting such as festivals and new music promoting. Her evening show catered for a smaller audience that were used to her style of presentation but it doesn’t work for a daytime show where there is a consistent style of delivery where the DJ’s talk clearly to the end of their sentences but I find Jo trails off so you end up missing the end of the sentence. Since the changes Simon seems to take more of a back seat as Jo dominates the show regaling tales of either thing’s she’s done or her family. The old show worked well and was a pleasure to listen to, but now I’m finding myself turning to BBC radio 5. I’m not against female presenters on daytime radio 2 and enjoy Sarah Cox & Vanessa Feltz presenting the daytime shows when the respected Mr’s Vine & Evans are unavailable. Whilst I agree there is zero chemistry between these two presenters, I’d give the show to Jo on her own and find alternative for Mr Mayo. His old show needed ditching, every show was simply the same and he’d absolutely no alternative start to any telephone conversation with phone-in listeners other than “What’s for tea then?…yawn, yawn. Alternatives? Amil does great job sitting in for Jeremy Vine, Sara Cox..even Gary Davies would better SM. No fun anymore, I used to love the ‘enjoy yourself , it’s later than you think” 🎶 music, I knew I was going home, the play list was better, it was hilarious. Now it’s a middle age music choice, dull format and I turn over in boredom every day. Such a shame. Definitely lost 2 listeners in this house, used to love Drivetime and All request Friday but no chemistry between the 2 of them! Both good presenters in their own right but please, please, please bring back Simon on his own (with Matt)! How many more listeners are Radio 2 prepared to lose from their Drivetime audience ? They have ruined a terrific show in the name of gender balance . How many more listeners are Radio 2 prepared to lose from their Drivetime audience ? Simon Mayo and team have made the slot their own over the last few years and now it’s a wreck. Sorry, but I cannot listen anymore. Please bring the old drive time team back. Simon and Matt go together like salt and pepper !!! They bounce off each other, sorry the new line up is not working, please listen to what your listeners are saying. Jo whiley is not a drivetime DJ,it simply cant and wont ever work.It wasnt broken so why change it.I think it comes across on air that Simon is just not comfortable and poor jo is trying her best to make this work,that how it sounds.Bring back Mayo. With so many others on this….Drive time wasn’t broken! Have tried to get on with the new format but it doesn’t work. Jo Whiley is a good DJ, talking to an audience but she is not a natural interviewer and so lacks the rapport with the team, callers and guests. Please bring Matt back and leave both Simon and Jo to do what they are good at. The trouble is Jo is not an entertainer like Simon. She is more of a journalist DJ like John Peel or Bob Harris which is a compliment. Simon and Jo just don’t have the same professional chemistry and that’s why people are tuning in to other stations at drive time. Get Jo back on her show and get the drivetime team back together. I agree with the majority of these posts, I no longer listen to the show. II used to love the Drivetime show while the dinner was cooking, but no longer. It’s just natter natter natter, and yet another female who never knows when to be quiet. (I am female btw). PLEASE can we haave the original Drivetime back??? Stopped listening after day 1. If it aint broke, dont try and fix it. Same with overnight. They booted the Dark Lord to BBC WM after a stint in BBC Kent. I also used to like the old Mayo show. Such a shame the BBC decided to ruin it. Miss Matt’s Moshing and ribbing of the host. Miss the cooking too. All gone and for what…….they maybe good chums, but that does not make a pairing to equal, say RadMac. Or even Simon and Dr Kermode. If the BBC really wanted to redress the balance, replace Steve Wright with Jo. That would work and reset the times back to where they were. I agree completely!! Both brilliant but not together. Drive time was a great show with some bits we did not like but this new format does not work. Simon with Matt, Bobby & Nigel on a Thursday was like a well oiled machine. The request shw on a Friday was first class, Simon can bring the best out of the younger listeners. Please revert to the original. I started listening when the program changed however, the show just doesn’t work. I’ve been a fan of Mayo for years but it’s awful now. I am always open to new things but like many people it’s hard listening and the extra hour is just painful. I used to cook to Jamie Cullum between 7-8 on Tuesday evenings now it’s too late and I end up putting on my own Jazz collection. Disappointed that the BBC have managed to spoil a perfectly good show,for reasons unexplained. We are referring to the Simon Mayo radio 2 show. I only listen on a Friday now, all requests by listeners, as always some cracking tunes picked by the listening public, and not as much waffle from the presenters! BBC – please listen to your customers – be brave and realise you have made an honest mistake! The farewell show was so sad and unexpected. I really don’t understand why the management can’t ask us, the listeners, what we’d like to listen to. Naive l know but rather thought WE were the point of broadcasting. And l totally agree about the dreary repeats during the night. Not everyone is snoozing away on their goose down pillows! It would be SO lovely to hear a warm human being keeping us company a la Richard Allison. 3WM FFS!! I just can’t listen to the new show. Its ruined my long commute. There’s no chemistry between the two presenters. It all sounds forced and has no spark, no life to it. The features are so lame it’s painful to listen to. I miss all the old features; like the book club, the mosh. Even the confessions sound lame and forced now. If Radio 2 want to do more for equality, why stop Jo Whiley from having her own show? It makes no sense. Quite like the new show, starting to grow on me. Agree with previous comments. Use to be an avid listener of drive time & loved the chemistry between presenters. Tried the new format but no longer listen to this show. How many more listeners are BBC prepared to loose. Really really tried, but can’t do it anymore. One more listener lost from drive time. Give Mayo his mojo back! I like Simon as a DJ and Jo as a DJ but not together it just doesn’t work. I now turn over to Radio 1 at 5pm. Please bring back the old format and team ! Hate the new show. Defected to Magic FM. I liked both Simon and Jo but not together – right from the start I knew it was going to work. I’ve tuned in to listen on and off since the show began and it’s no better. There is simply no chemistry. The features are boring and I find myself wondering what age group they’re focusing on since it’s kften reminiscent of Radio 1 in the 80s roadshow days! Simon sounds so happy and relaxed on the new podcast, unlike on R2 now. Big mistake to cancel such an intelligent and entertaining show! You’ve lost me as a listener. Agree with all the comments here but let’s be 100% honest with each other that whether it’s on this site, direct to the BBC or shouted from the heavens nothing will change. The BBC is now being sorry has been overrun with politically correct management morons who don’t give a four x about quality radio or what the listener actually wants to hear. From Lesley Douglas onwards Radio 2 has been on an ever increasing slippery slope down to heaven knows where. Who can forget the recent overnight reshuffle shambles they have now tried a pathetic U turn on completely missing the point that it was Alex and Janice that made that overnight slot and that is what the listener wanted back. In this nutcase age of everything being politically correct it is a pity the BBC are not as worried about ageism as they are about female daytime presenters. Bob Harris and Paul Jones to name but two quality losses. Mark Lamarr lost as well and yet another perfect example of where the BBC have lost the plot over either kicking out or making it impossible for knowledgeable quality broadcasters to remain by taking all their creative freedom away. Exactly why Lamarr and others have walked. As all of us here are paying a licence fee to listen to something different. I do not expect to be treated in the same fashion as commercial radio now does and I certainly do not expect the BBC to start copying them by dumping the likes of the names mentioned for TV celebrities et all. Pity they could have been so female concerned years ago by giving Anne Nightingale a daytime show or stopping Douglas kicking Jane Gazzo off of 6 Music! I’m not opposed to change except that these decisions are not based on making quality radio but they never will be anymore as there is nobody left in control of national BBC FM music radio who has a bloody clue what they are doing! In the defence of these people that is not their fault as quality radio and respecting the opinions of their listeners is no longer their job or remit. The best music radio attempt by the BBC at the moment is 6 Music. Not perfect I know but fast becoming my preferred choice of BBC station. Wonder what would happen if they took that from DAB to FM !!! I suspect quite an embarrassment for their lost Radio 1 and 2 audience figures?! That begs the further question about how Radio 3 with it’s lower audience figures than 6 Music commands does not suffer the constant interference against its listeners and programmes that Radio 2 does. Obviously the most listened to drive time show the UK had just had to be interfered with!! Idiots. You lot just rock on regardless. I think in the end internet radio will repeat what the pirates did to the light prgrammme. Some people will never learn or be told anything. Those with the power and the money always know best! I miss Jo Wiley’s show, it had a very warm and friendly feeling, it is unfair that she is getting all this stick for being useless in Drivetime when it is just that the format does not suit her style. If the BBC really cared about women it wouldn’t have booted Janice Long unceremoniously off the air. I totally agree with all the comments saying they should give the Steve Wright slot to a female presenter, I just can’t understand how Steve Wright has been able to occupy that slot since shortly after Marconi invented wireless, think he must know something compromising about the DG! I can’t bear him, almost anyone would be better. So BBC 2 have decided to sacrifice a great show in the interest of political correctness. The new format doesn’t work, and it is sheer stubborness on behalf of management to refuse to acknowledge that they have made a mistake. Give us back the old show or I continue to listen to LBC. Simply stopped listening to the terrible new Mayo whilley show thing. What a pity, only, 16 million listeners. Who was the moron who ruined a great show? The programme is truly woeful. There is no chemistry between the presenters it’s clear they are not comfortable in each other’s company so it sounds very contrived. There is something sadly lacking in the show now. It’s time to call time before any more haemorrhaging of listeners occur. I haven’t got an iPhone so unsure how I can listen to the podcasts as I would like to hear the commaradory between Simon and Matt again. Love Simon Mayo and love Jo Whiley… but bbc radio 2 it’s just not working. I find it difficult to listen to sort of confusing!! as they are both strong presenters. It needs sorting out! Bring back the old drivetime. What an awful show right now! Simon had the perfect recipe with the team around him. If the controllers couldn’t see that then they need to be reassigned. BBC wake up!! I listened to a response to the many complaints regarding the new show, if you can call it that. The guy was adamant they would not change back no matter what. How arrogant is that to assume the listener doesn’t matter. He said give it a chance, no point you either have the chemistry which makes the show outstanding or you don’t. The show is now boringly annoying and I tune to another station. Jive Jo a journalistic show which is more here style. The BBC said this had nothing to do with the PC movement to address the male / female balance, who do they think they are kidding. I listened regularly to both Simon and Jo in their old guises and enjoyed them both intensely, especially Drivetime, which i miss. I tried again only yesterday but cannot stick with the programme. Both excellent djs in their own territory, but this is uncomfortable and not improving. New show is like Chinese water torture. Yes you can tolerate it for a bit and think it’s not so bad. But then ultimately it drives you mad. Why replace the intelligent with the inane? The presenters don’t seem to enjoy it much. The audience certainly don’t. However don’t back against Carnie and Shennan being so dogmatic that it’s Simon who goes rather than the surpringly self obsessed Jo. My evenings have lost focus now as no longer listen to drive time. Love both presenters but not as a team. Do something please. I too have given up drivetime. Seems that 2 presenters who may get on personally do not necessarily gel as a team. And where’s the book club? Very disappointed with r2. I know things can’t stay the same forever. Bit nobody changed the Wogan show it just developed. Loved the old show, both the DJs are great but disastrous together. Jo is so knowledgeable about music, why not shift Steve Wright!! Such a shame that the BBC had to go & spoil Drivetime!!!! Totally missing the belly laughs of Simon & the old team. There’s just no chemistry between Simon & Jo & the show is just sooooooo boring!!! The arrogant controller of BBC 2 radio said people have rushed to judgement on the new show and no doubt this clown was the one that wanted to change. 6 million listeners and what he’s done is lose a lot of them cos he had a brainwave. Shows should only be changed or looked at when you lose listeners. This show now has no energy fun or appeal. Simon and Jo are quality acts but not together. Fire the controller of BBC 2 radio as the problem is right there. I used to enjoy my journey home listening to drivetime and continued when I got home. I listen to radio2 on my way to work and also in my lunch hour but on my journey home I switch to heart. Jo Whilley speaks far to fast to understand her and she just sounds uncomfortable. The old drivetime everyone jelled and didnt seem to worry if one person spent more time talking. Now it seems that they both have to share equally it sounds like a tennis rally to him to her to him. Come on BBC admit it it isn’t working. Bring back the old drive time that did work. This format is NOT working. Two good presenters but not together! No chemistry..sounds awkward and Jo sounds defensive at times making it most unpleasant to listen too. A HUGE mistake BBC….you should listen to the fee paying audience! Simon, Matt & Bobby the perfect trio of natural friendship, humour, grumpiness & qwerky view of life. The only time I enjoyed Radio 2 – I’ll just have to go back to Radio 4 now. In my opinion the new BBC radio 2 drive time format just doesn’t work. Feels like two good presenters each trying to do their own show but not working together. Please bring back Matt Williams and two separate shows and stop fixing what isn’t broken. On Radio 2 I particularly love listening to Ken Bruce (miss Lynn Bowles), Jeremy Vine, Graham and Maria on Saturdays and the old drivetime show. Matt and Simon and Bobbi were brilliant together, naturally fun and uplifting. I used to like Jo’s evening slot as she introduced great music. That’s where she belongs. The new show is never going to entertain like the old one. Please listen to your listeners BBC and bring back the old format. I don’t understand why you chucked away something so good. Loved the old show! Hate the new show, tried it on a few occasions but it’s just bland.. I love mayo and the old team, it worked because it wasn’t a forced partnership. No doubt someone at the beeb gave himself a big pat on the back and bonus for this tripe. I want a refund! Drivetime was always my favourite programme but the new format is toe curlingly embarrassing to listen to. There is no chemistry whatsoever between them, Jo is constantly butting in and makes the most inane remarks I have ever heard on radio. Surely BBC you realise how many listeners you are losing on a daily basis. I switched off midway through day one but listened again on 25. 06 to see if it had improved, it certainly has NOT! I will not be listening again until the old team is back. sorry to say but please bring back Simon and Matt. As with many others I have stopped listening to drivetime. I used to laugh driving home. The chemistry was there but no more. Like the cabinet, maybe a reshuffle required. I tried Drivetime again last night, trying not to be biased….I failed. Please BBC listen to your audience!! Return DT to how it was. It wasn’t broken!! Has anybody with authority/ audience interest spoken to the BBC? I have emailed the Drive Time email address. No surprise there has been no reply. I got no reply either when I tried!! Not good. Like you I tried listening again out of loyalty to Simon but it was awful. Jo keeps talking over him, she thinks she runs the show….RUINS it more like. BBC, give JO her own show if you want to be politically correct, then we can turn it off! Thank God for 6 Music! There is a saying. If its not broke don,t fix it. Well you have truly broke this popular programme. Tonight Jo Whiley made an idiotic comment. She and Simon Mayo played Ultra Nate – Free. After the record finished she said that she didn’t know how to pronounce her name. In all the years she has been with the BBC and her knowledge of music, this was a stupid comment to make. This show is complete car crash and I totally agree with the comments aired. I have also written to the BBC but it will probably fall on deaf ears. BBC – do something, Simon Mayo has been loyal to you….your reciprocation would be good!! Hi Tracy, I have had a reply from the BBC and they have come out with the same old excuses eg give time for the new show to work etc. So have replied to say that you haven’t answered my question about Jo Whiley and want answers. Simon Mayo has been made a complete scapegoat.